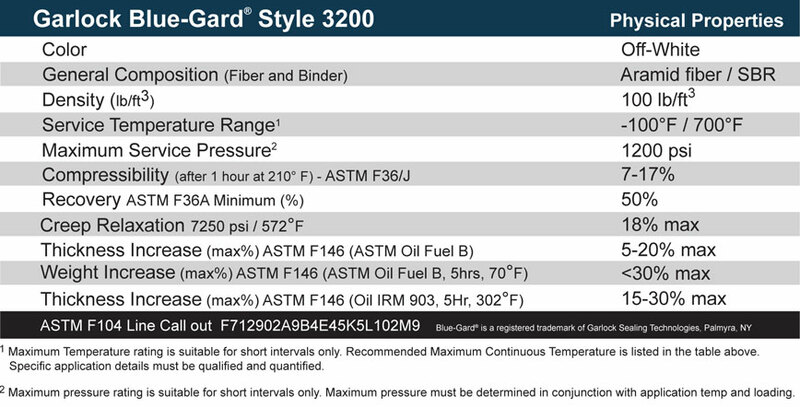 Manufactured with a unique blend of aramid fibers, fillers, and an SBR Binder, Garlock BLUE-GARD® 3200 is a high quality general service sheet. Operational costs are cut through reduced waste, maintenance, fluid loss and energy consumption. It is recommended for use in sealing against water and wastewater treatment, gas production and delivery (including inert gases) and power generation (steam), and can handle service conditions up to 700℉. For ANSI Standard Gaskets, select your size and style below. 1 1/4" 1 1/4" 1 1/4" 1 1/4"
1 1/2" 1 1/2" 1 1/2" 1 1/2"
2 1/2" 2 1/2" 2 1/2" 2 1/2"
3 1/2" 3 1/2" 3 1/2" 3 1/2"